From Amazon: The classic pulp vigilante, reimagined for a new generation! Tony Quinn is a brash defense attorney to the mob who compromises his ethics for financial gain. When he refuses to cross the line and commit murder, he is tortured and blinded by his gangster employers. When a fortuitous meeting with a covert agency gives him a chance to make amends, Quinn transforms into the Black Bat and embarks on a redemptive quest to right the wrongs of his past. 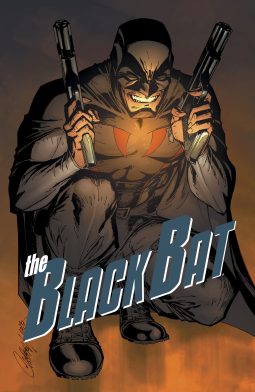 Collects the complete story from issues #1-12 of the Black Bat comic book maxi-series. As in many cases, it is easy to see where the inspiration for many of the modern super-heroes can be found in the pulps. I imagine that some of the origin of Daredevil came from this character. A brash attorney becomes a blind hero. Daredevil took a different path after starting with some of the same concepts. Daredevil never became a lawyer for the mob for one thing. And the Black Bat was given a way to compensate for his blindness by a shadowy organization. Brian Buccellato impressed me with his work on the New 52 reboot of “The Flash”. His writing, in conjunction with Francis Manapul, helped to make that title a success. He continues to turn in good work with “Black Bat”. I have enjoyed many of the Dynamite series based on the pulp characters. I am adding this to the Dynamite list that includes “The Shadow”, “Doc Savage”, “ Green Hornet” and others. This is a great collection to pick up since it contains all of the issues of the maxi-series. If you are a fan of pulp characters or just good storytelling, definitely buy this one.